David Huynh and Mia Katigbak in The Trial of the Catonsville Nine. Top: Huynh and Eunic Wong. Over the course of the trial, the group’s members attempted to draw connections between issues, only to be told, “We are not trying that case.” Berrigan cannily demonstrates how all social and political issues are linked, no matter how much the powers that be might wish it otherwise. There is little self-awareness in this hyperbolic play (which, for example, draws parallels between the U.S., with its involvement in Vietnam, and Nazi Germany) but plenty of fervent belief in its own virtue. Yet the play engages in its own bit of division by almost entirely removing the point of view of the war’s victims in order to celebrate antiwar activists. 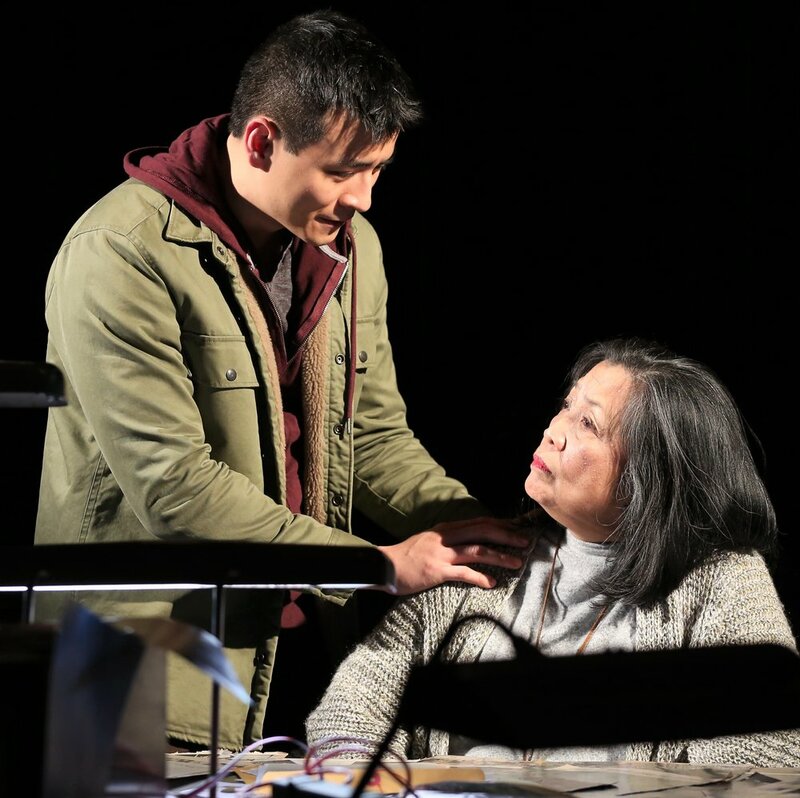 With a cast of only Asian-American actors, this production, directed by Transport Group artistic director (and Catonsville native) Jack Cummings III and co-produced by the National Asian American Theatre Company, provides a small corrective to the play’s narrow viewpoint. Actors David Huynh, Mia Katigbak, and Eunice Wong are generous performers. Their well-rehearsed connectivity overcomes Cummings’s hyperactive staging, which seats the audience on spartan wooden pews around the perimeter of the Abrons stage (the theater’s actual seats are unused) and often pulls the actors to opposite corners of the set to bring them nearer to the viewers. The performers shift characters and locales quickly to accommodate the verbatim format, as witnesses take turns testifying. Unfortunately, these shifts happen so often that each role is given only the most superficial characterization; there’s no time for the internal tensions and oppositions that make a character interesting. Katigbak is best able to find colors in the characters she plays, while Huynh has been directed to deliver every line at a relentlessly humorous, overbearing pitch. In this he reflects the production as a whole. From R. Lee Kennedy’s blood-red lights, which bathe the space as the actors enter the theater to the accompaniment of Barry McGuire’s 1960s protest classic “Eve of Destruction,” to sound designer Fan Zhang’s Brian Eno–lite score and omnipresent low rumbles, shaking the pews, the evening is monochromatically morose. The subject matter is undoubtedly solemn, but by denying the pleasure of activism, the full-body thrill when the match strikes the napalm, The Trial of the Catonsville Nine has made the Vietnam War the one thing it was not and theater the one thing it should never be: boring. Huynh and Wong. Photographs by Carol Rosegg. The evening’s best theatrical moment comes near the end of the play, when the stage curtain on one side and the loading door on the other side drop quickly, cutting the audience off from the outside and blinding them with white-hot lights. Setting aside the hypocrisy of a production with so little self-awareness daring to interrogate and implicate its paying audience, the moment at least packs a visceral thrill. Yet the thrill dissolves when the curtain rises at the end to reveal the empty auditorium filled with haze and more blinding white lights, into which the actors disappear as though passing through the pearly gates. The angry protest music of the actors’ entrance becomes the New Age-y strains of DJ Drez’s sitar-heavy “India Dub” of “For What It’s Worth” (you know: “Stop, hey, what’s that sound, everybody look what’s going down”), and a benign evening honoring activists blossoms into full-blown, tone-deaf hero worship. Berrigan’s fawning platitude is little better than the propaganda that implores Americans to honor “the troops.” The truth is, we don’t need any play, ever, and it’s past time that productions like The Trial of the Catonsville Nine, which mistake gravitas for gravity and crocodile tears for emotional heft, stop taking that fact for granted. 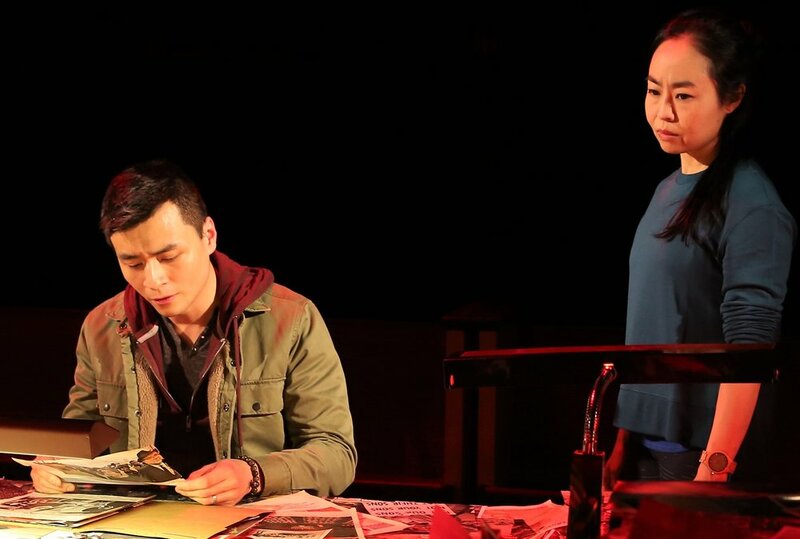 The Transport Group and the National Asian American Theatre Company’s production of The Trial of the Catonsville Nine plays through Feb. 23 at Abrons Arts Center (466 Grand St.). Evening performances are at 7:30 p.m. Tuesdays through Saturdays; matinees are at 3 p.m. Sundays. For tickets and information, call OvationTix at (866) 811-4111 or visit transportgroup.org.